As promised a few weeks back when I started my 'Katie Jump Rope' quilt, a tutorial about the double hourglass block. There are many, many rulers available in the quilting world but I dare say only a few are really necessary. 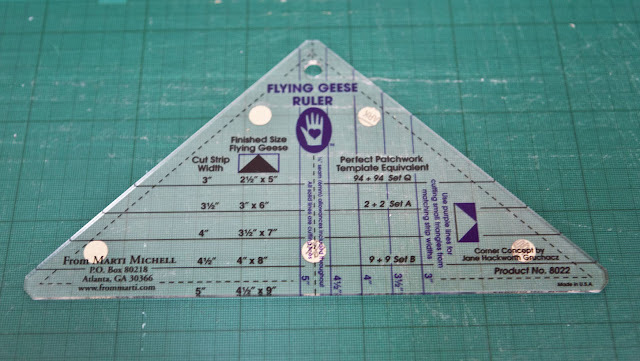 That is of course your normal, 12 1/2 " ruler and the longer brother if you wish, a couple of square ones for squaring blocks, a flying geese ruler and maybe one or two more triangles rulers of varying degrees. 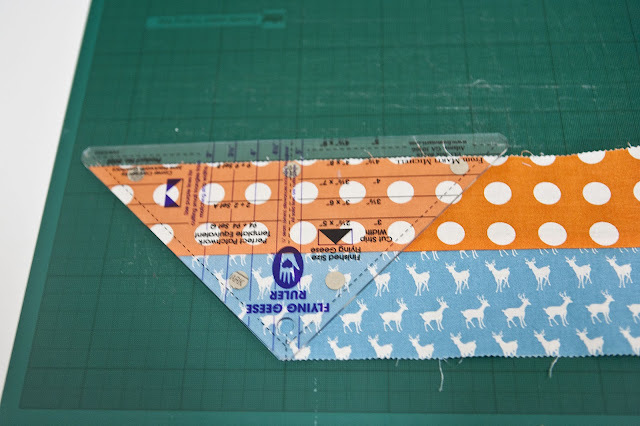 Of course you actually can make almost any shape you like by using the normal 12 1/2" ruler or a template. 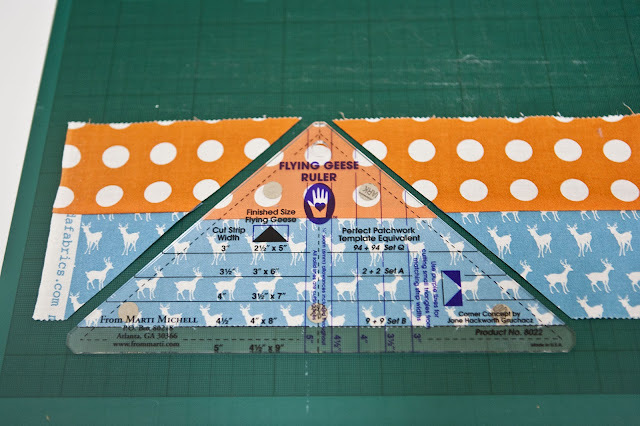 But some of the rulers make quilting life a little easier and as I happen to have a flying geese ruler and don't particularly like templates for repetitive cuts (my template tend to get smaller all the time) I thought I share with you my method. So let's get cracking then. First things first. 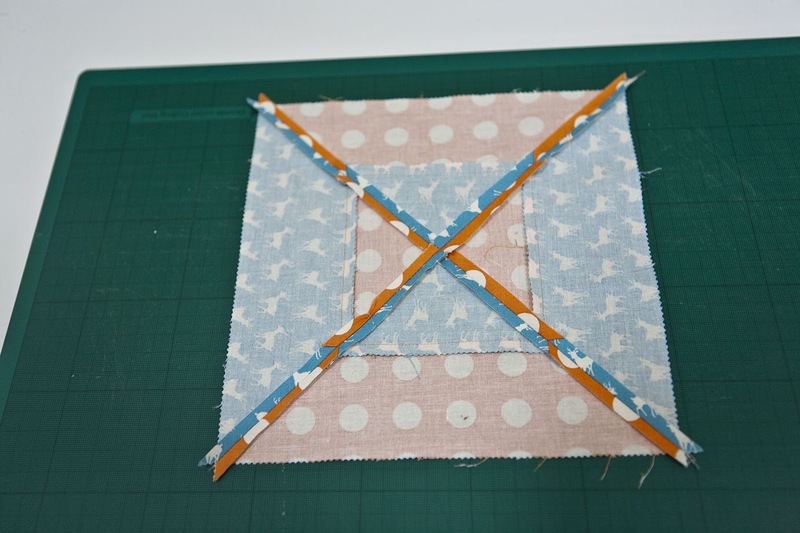 I cut my strips generously and square the finished block also generously in the end. 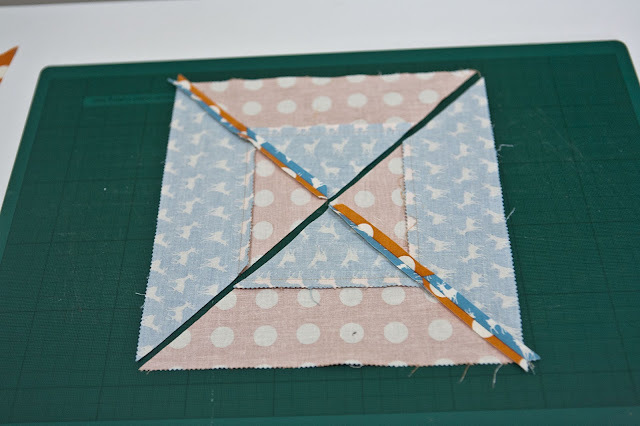 This block is not difficult to sew but it has a tendency to create slightly wonky triangles in particular when you use strips that are cut on the bias (such as jelly role strips). 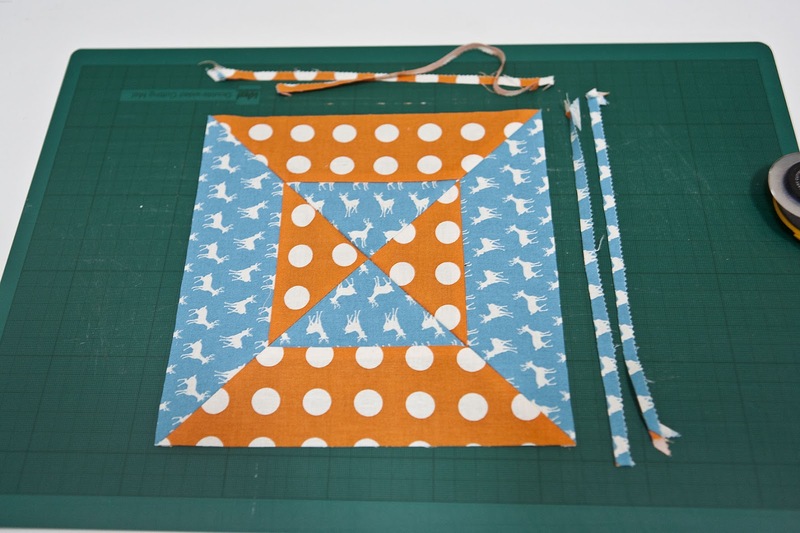 So to be sure to have a square block in the end, you need to start with generous allowances. 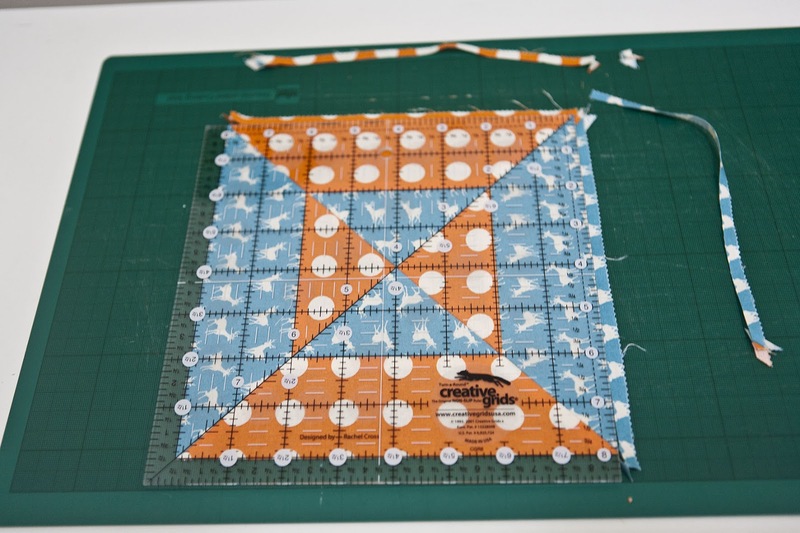 Also try out a block before you start cutting dozens of strips to make sure you are happy with your block. Strip and block sizes: Calculating the finished size of the block is really easy using a flying geese ruler. As you can see it has measurements on the horizontal lines starting with 3" increasing in half inch increments to 5". Next to these you see measurement indicating the size of the finished flying gees block. For example on the 4 1/2" line you see 4" x " 8". 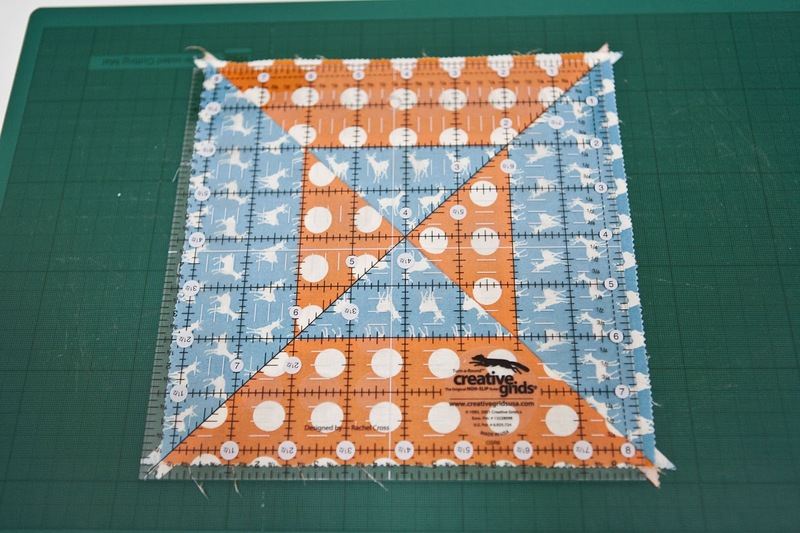 A flying geese block is rectangular but your finished double hour glass block will be square. So the second of the measurement, in my example the 8" mark will give you the size of the finished block. 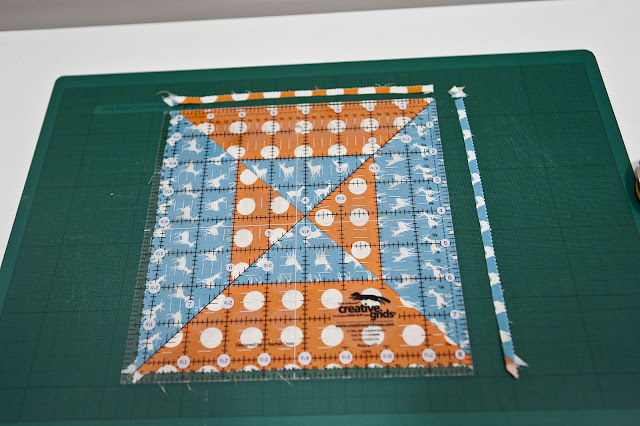 Staying with the 4 1/2 " example which is incidentally the width of the strip if you sew together two jelly role strips (they are 2 1/2" wide each) you will get a finished double hour glass block of 8" after you have sewn it together with the other blocks (so 8 1/2 " before that). 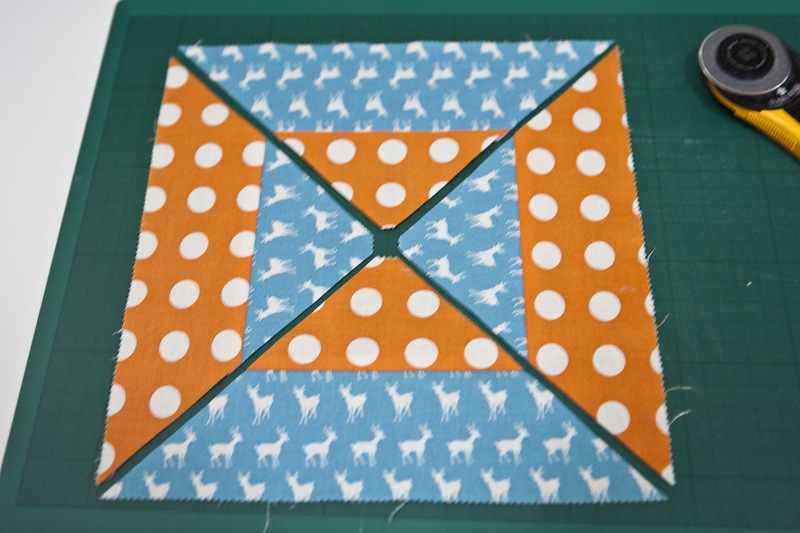 This is if your block is perfect but as already mentioned earlier I like the square them of generously so my finished block in this case would be 7 1/2". So if you want for example a 7 " finished block find the measurements on the ruler and you will see that the 4 " horizontal line is your guiding one. This will tell you that you need a strip of 4 " width. 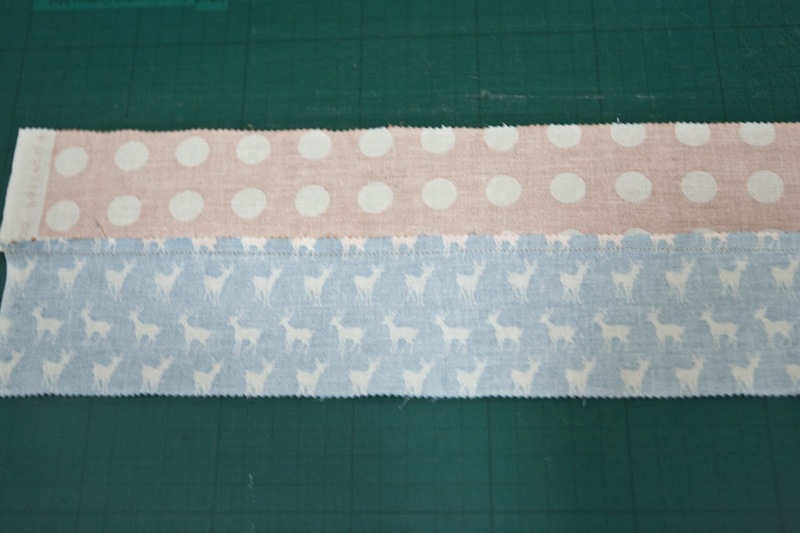 You achieve this by sewing together two strips of 2 1/4 " width. I personally would square of this block to 6 1/2". 3. Sew together two strips of equal width (this tutorial uses two jelly role strips) and iron the seam allowance to the darker side of the fabric (if you have a darker side). When sewing strips together it is very, very important to avoid banana curves. 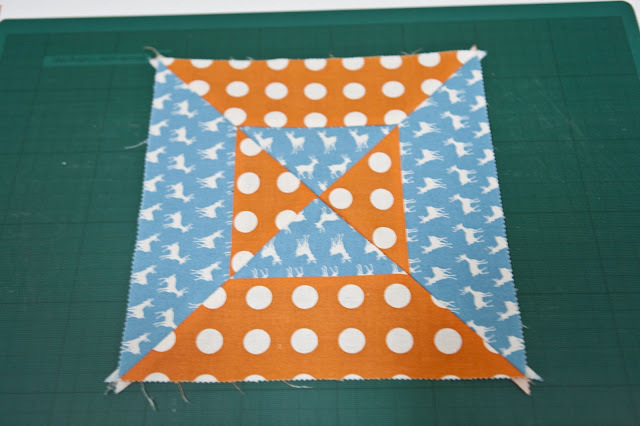 This can happen when sewing long strips together as most sewing machines have a tendency to pull the bottom fabric a little more than the top. You can minimize or avoid it by making sure you start of with two equal length that you hold on tight when feeding them through the machine. 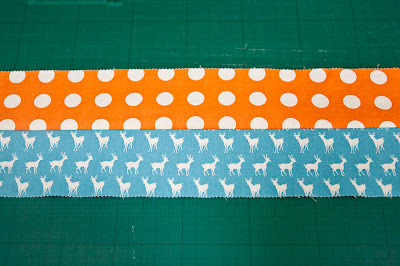 In addition pull both of them slightly to the left when sewing. 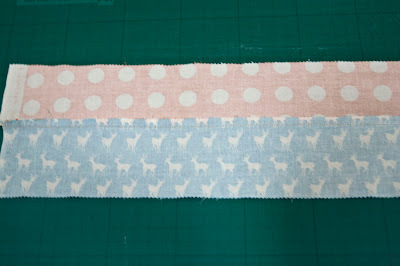 Each machine is different however so best is to sew a sew strips together and see how they turn out. 4. 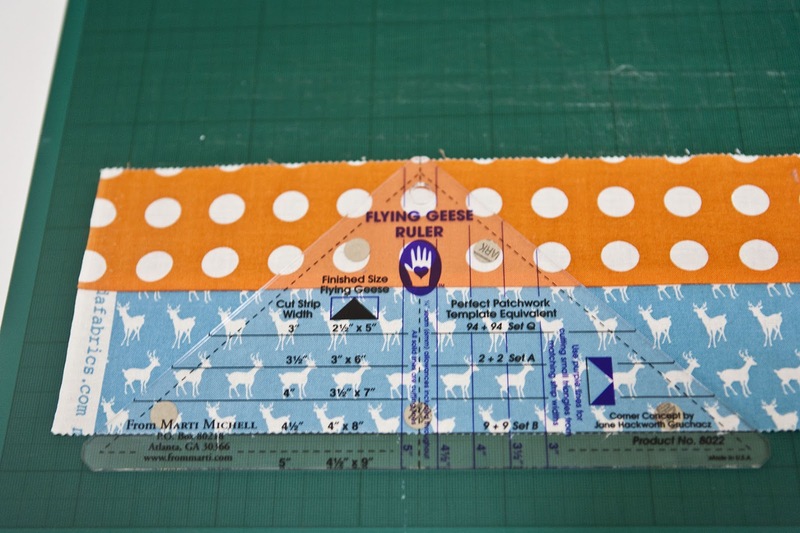 Take your flying geese ruler and position it on the strip ensuring that the horizontal line of your chosen size choice (here 4 1/2 ") is level with the bottom edge of the strip. 5. 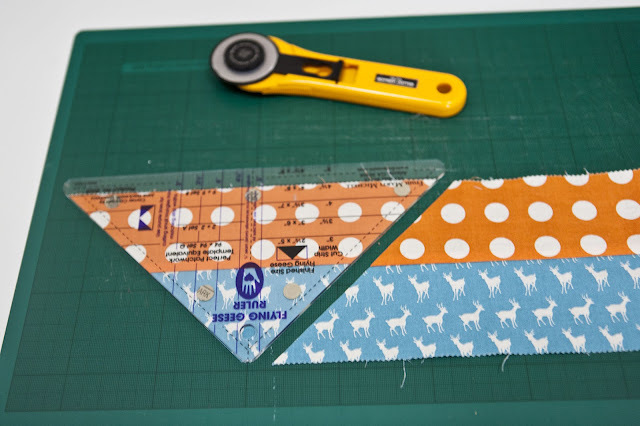 Cut alongside the right and left side of the ruler and you have your first of four triangles. the strip and the left ruler side with the now diagonal edge of the strip. 7. Cut along the right side of the ruler and repeat step 4 to 7 once more. 9. 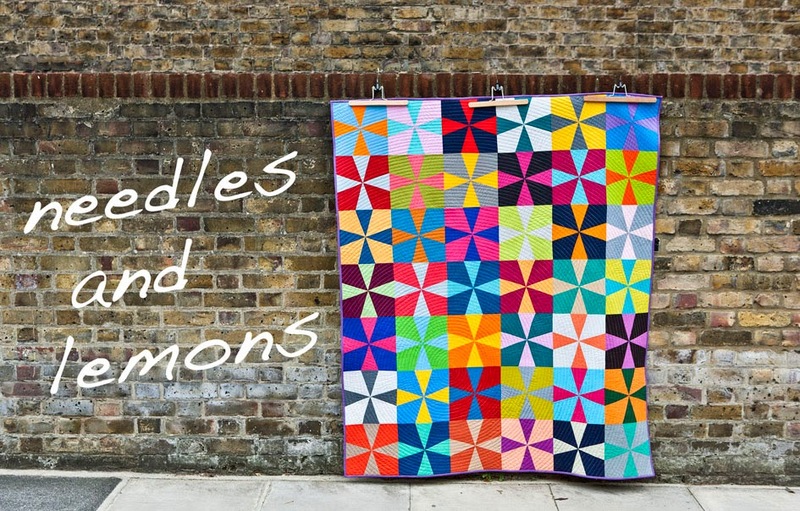 Now sew together two contrasting triangles. and left one together) and not the same ones. should be in opposite directions to avoid bulk if you don't iron them open. 12. Again iron seams open. This is now a really nice and flat block without any bulk at all. need to square them off at all. 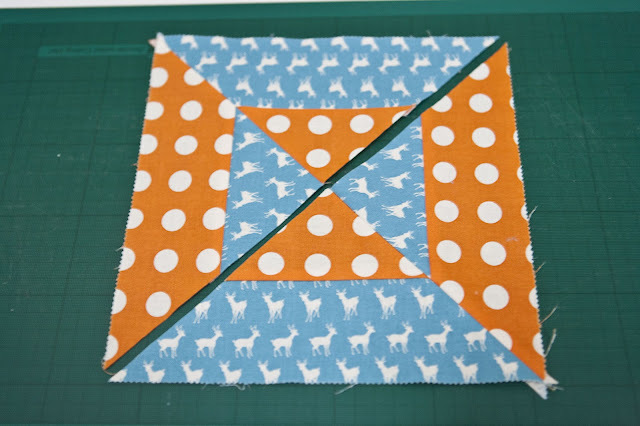 After you have squared the two sides the block will look like this. original was to blurred. If you look closes I already had cut the seams of at the left and top). And this is your finished block. I hope this was useful and please let me know if anything is not clear or you may have questions. Oooh that looks so good! Great block! 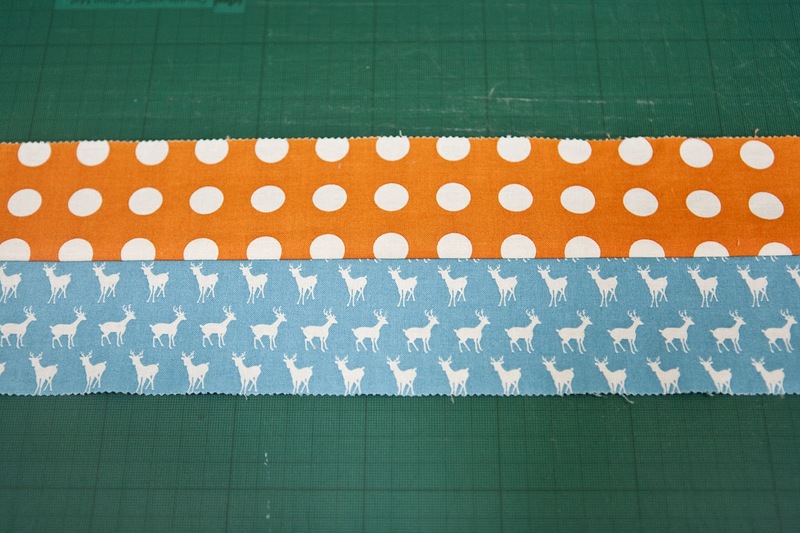 Love your fabric choices!